How the brain controls impulsive behavior may be significantly different than psychologists have thought for the last 40 years. That is the unexpected conclusion of a study by an international team of neuroscientists published in the Aug. 31 issue of the Journal of Neuroscience. According to Logan, there is clear evidence of a link between reaction time variations and certain mental disorders. “In countermanding tests, the response times of people with ADHD don’t slow down as much following a stop-signal trial as normal subjects, while response times of schizophrenics tend to be much slower than normal,” he said. This discovery forced them to make major modifications in the existing cognitive model of impulse control and is an example of the growing usefulness of such models to understand in much greater detail what is occurring in the brain to cause both normal and abnormal behaviors. The researchers directly tested the threshold hypothesis by analyzing recordings of neuronal activity in macaque monkeys performing a visual eye movement stopping task. In this task, the monkey is trained to look directly at a target that is flashed in different locations on a computer screen, except when the target is quickly followed by a stop signal. When this happens, the monkey gets a reward if it continues to look at the fixation spot in the center of the screen. In the experiment, the delay between the appearance of the target and stop signals ranged from 25 milliseconds to 275 milliseconds. 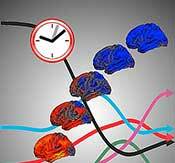 During this time, the movement neurons are still processing the signals generated by the appearance of the target. The longer the delay, the more difficult it is for the monkey to keep from glancing at the target. In both humans and monkeys, the reaction time in these tasks is significantly longer immediately following the stop signal.